Artistic Director & founder of Infused Performing Arts began her first ballet & tap class at age 1, and performed onstage at age 3 , for the first time. Tina has extensively trained in Jazz, Modern, Bharatanatyam, Hip-Hop, and Bollywood dance under the guidance of distinguished dance masters in the US and India. She presented her Bharatanatyam Arangetram in 2006, under the guidance of Guru Smt. Malini Menon. 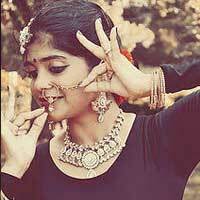 Tina continued her dance career by competing and performing around the US on over 1000 stages and winning “First Place” & “All Star Awards” in Bharatanatyam, Folk, Cinematic, and Bollywood Group dances all over US. She was crowned the prestigious title of Miss FOKANA in 2006, and was selected to welcome and perform for the Indian Ambassador In New York that same year. She was a background dancer in Bollywood movie “Ta Ra Rum Pum” featuring Saif Ali Khan & Rani Mukherjee. 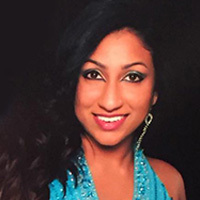 Tina began teaching dance at the young age of 14 years old, and has gone on to produce numerous award winning & nationally recognized students in folk, Indian classical, Bollywood, and western dance forms. Tina has been recognized for her use of technique, stunts, and hard-hitting choreography. Tina performed with Bollywood Star Govinda as his partner at the Bollywood Grind concert. She has Choreographed dances for & performed along with many South Indian Cine Artists like Parvathy Melton, Vimala Raman and Vineeth Kumar. She was the official choreographer for Shunya Theatre’s musicals “Adventures of Hanuman,” “Jungle Book” & Widow of No Importance.” Tina is a licensed Zumba Fitness & PiYo Instructor. She instructs these fitness formats at various gyms across Houston to promote and encourage health amongst South Asian women. 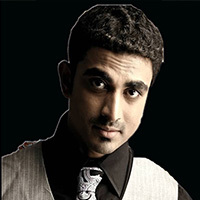 Kiron Kumar, Master of Modern Dancing and expert in the art of Magic originally hails from Thrissur, Kerala. Kiron Kumar blessed with highly acclaimed talents in Acting, Mimicry, and various forms of Creative Arts, is a Graduate in Commerce and completed his IT training and currently on assignment as IT Specialist in U.S.A. Currently Kiron Kumar is the co-owner and Creative Dance Director at Infused Performing Arts teaching Contemporary and Bollywood Dance Styles to kids age 4 thru adult. He is also teaching Magic. "Balshree" Award winner for Creative Performance in Dama & Magic from Former President of India Hon. K.R. Narayanan in New Delhi in 1998. Kiron Kumar learned Mridangam since high school for 4 years and performed all thru out Kerala and India. Learned and practiced Magic for 8 years and won the Kerala State Award for Best Magician for 4 years in a row and performed Magic in various stages in Kerala, India and Gulf Countries. 1st place winner in Mono Act at the Inter Collegiate competition for 2 straight years. Drama Artist from the age of 10; competed and won awards in Drama competitions and stage performances as Actor all thru out Kerala and India. Choreographed dances for Malayalam Movie Actors: Bhavana, Nayan Tara, Navya Nair, Anu Joseph, Dimple, Vineeth Kumar, Sukanya. Anchor for various Stage Shows across India/GULF/USA and various local TV stations in Kerala including Asia Net Plus. Owner and Instructor at the Dance School "Mayura Nrithavedi" in Thrissur, Kerala. Dance Choreographer for various Dance Shows in India and abroad including New Jersey and New York and also in Gulf countries. NAINA 2010 Conference- Choreographed opening theme dance which combined Magic and Bollywood dance for the 1st time in USA. Copyright © 2019 Infused Performing Arts All Right Reserved.